Tottenham Hotspur began their first Premier League campaign under Mauricio Pochettino with a 1-0 win at West Ham United. Kyle Naughton's red card on the half-hour mark provoked a familiar sense of dread among the visiting fans, but the home side's tactical frailties gave Spurs the chance to steal a winner late on – and they did.A week later, after a fruitful yet jittery midweek performance in Cyprus, Tottenham put on one of their finest displays at White Hart Lane since the days Luka Modric would orchestrate the midfield so amply. So what have we learnt from Spurs' first competitive week in the hands of Pochettino? Despite breaking into the Tottenham and England first teams respectively in the early stages of last season, Andros Townsend came under a lot of criticism for a number of reasons. The winger often appeared selfish last term, with poor decision making and wayward shooting failing to help his cause. But what Townsend brings to the team is intent, which, in practice, leads to impact. When compared to Aaron Lennon, who's Tottenham career is beginning to stagnate, Townsend is a genuinely exciting prospect, albeit a rough diamond. Pochettino seems to prefer Lennon on the left as opposed to the right hand side where he had become predictable and stale. In pre-season, Lennon appeared most useful when peeling off his marker into the centre, getting on the end of through-balls from the likes of Christian Eriksen and Erik Lamela. Those playmakers failed to have much of an effect on the game at Upton Park, and so Lennon became increasingly redundant throughout the contest. Townsend's arrival refreshed the side, bringing pace, pressing and a previously absent goal threat. This is what Townsend contributes, and unfortunately what Lennon lacks. Excitement surrounding Townsend receded slightly when he was dropped from the 18-man squad against QPR. Prior to this, Erik Lamela was introduced in place of Townsend in Cyrpus, contributing more in seven minutes than Townsend did all game. At the time of writing, reports suggest Spurs have rejected a bid from Southampton for Townsend. There could be room for both Townsend and Lamela in a progressively-minded line-up, but it wouldn't be surprising if the former was included in a potential move for Morgan Schneiderlin. More on Lamela later. Analysis of Holtby more often than not drifts into clichéd territory. On the face of it, the German should suit Pochettino's philosophy down to the ground. He'll press, he'll run for 90 minutes, he'll get stuck in. Said attributes, however, are useless if not utilised properly. Holtby will always graft for the team, but if he isn't closing down the correct areas, he isn't aiding the side. If retained, Pochettino will hopefully mould Holtby into a more intelligent footballer. For now, his erratic nature must be used only when needed. Taking risks is only useful then risks are needed. At Upton Park, Holtby's impact was indisputable. Entering the fray at the same time as Townsend, the pair's desire was palpable, changing the pace of Spurs' attacks and instilling the positivity that forced Sam Allardyce into a defensive change. Holtby may lack intelligence on the ball, but he always wants it. Prior to his arrival, the attacking midfielders were failing to drop deep enough in order to collect the ball and begin attacks. Holtby was intent on dictating from deep as well as pressing high up the field, proving to his doubters he can play an important, albeit bit-part, role this season. 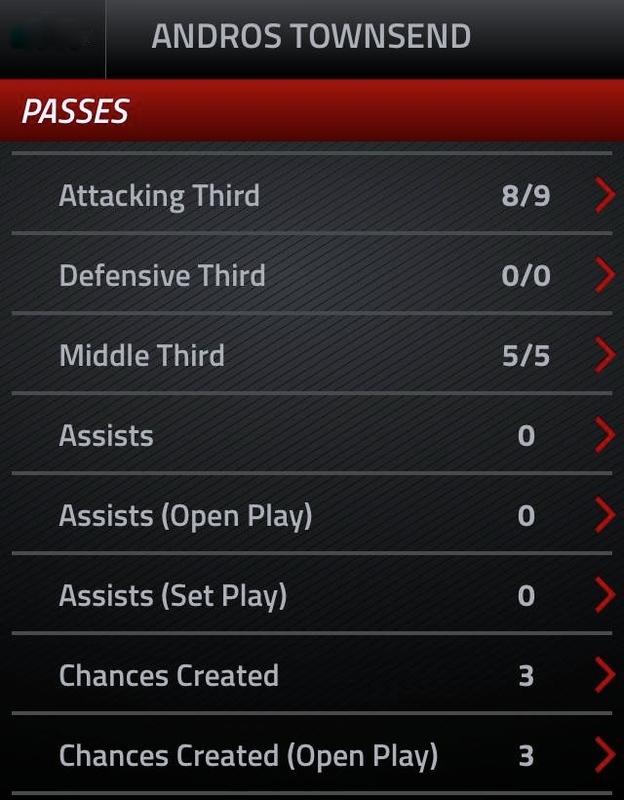 Unfortunately, the midfielder was less than impressive against Limassol. Rarely threatening in the attacking midfield three nor the first midfield band, it remains unclear what Holtby's best position is; this could be a problem in a squad heavy in central personnel. He was an unused substitute against QPR. Mauricio Pochettino is renowned for the pressing, attacking philosophy he instilled so impressively at Southampton. While that style appeared to have already been implemented in pre-season, the West Ham game made it clear the system hasn't been fully drilled into the players yet. This, like every new regime, will inevitably take time. Promisingly, certain members of the squad looked comfortable with the high-press at Upton Park. As aforementioned, Holtby's attributes suited what was needed on the day, but even he will have to adapt to Pochettino's tactics when they are in full swing. Nabil Bentaleb looked particularly at home with the system against West Ham. The young Algerian closed down space extremely well and passed the ball cleverly. Once he shakes off the “Sherwood's pet” association, which shouldn't take long, he should become an integral part of the squad. Despite a slightly sloppier performance against QPR, Bentaleb still received a standing ovation from the fans who, like it or not, have Tim Sherwood to thank for this one. Other members of the group will experience a bit more of a lengthy adaptation process. Despite Christian Eriken already comparing Pochettino's style with that of Ajax – his former club – the Dane looked a tad complacent at times at Upton Park, particularly when the home side were on top. That's not to say Eriksen played badly, nor did Erik Lamela, but this didn't spare the duo from Ruud's Gullit's critically unfair punditry on Match of the Day. While it's true Eriksen and Lamela weren't in full flow in the first league game, their undoubted talent will unquestionably shine through this season. Both are expected be focal points in a very talented side. Lamela may take a little more time than Eriksen. Hopefully, the 22-year-old will flourish under fellow Argentine Pochettino's management. It must be remembered that last season wasn't exactly a “settling in period” for Lamela. A run in the team, as opposed to sporadic appearances early in the previous campaign, will do him the world of good. Roberto Soldado's inclusion in the first eleven may also have an effect on Lamela's form; the pair's link-up play in pre-season was superb. They continued their fine partnership in Cyprus with a beautifully worked equaliser. Minutes on the field together could prove pivotal to both players' future fortunes at White Hart Lane. Lamela truly came to life against a woeful QPR side. Notwithstanding the visitors' careless performance, Tottenham's record signing was utterly unstoppable at times, closing down quickly, attacking with intent, taking the ball past opposing players with ease. It must be reiterated, however, that patience is needed. Lamela was brillaint on Sunday, if not a little raw. Pochettino will shape both the player and the system into a potentially accomplished product, but it will take time. Encouragingly, Pochettino's philosophy appeared to be sufficiently discernible at White Hart Lane on Sunday. The whole team pressed, worked hard and countered. Possession was comfortable and utilised with attacking endeavour. Chadli's first goal and Adebayor's solitary strike came from winning the ball and attacking quickly. Contrarily, there were 48 passes in the build-up to Chadli's second. Patience followed by a killer blow is seemingly another key to the system. Every player had a touch of the ball in the creation of one of the best team goals the Lane has seen for years. Etienne Capoue was responsible for 14 of those passes, and was an essential element in the transition from defence to attack throughout the match. Currently, Morgan Schneiderlin would find it very difficult to displace Capoue from the starting eleven. 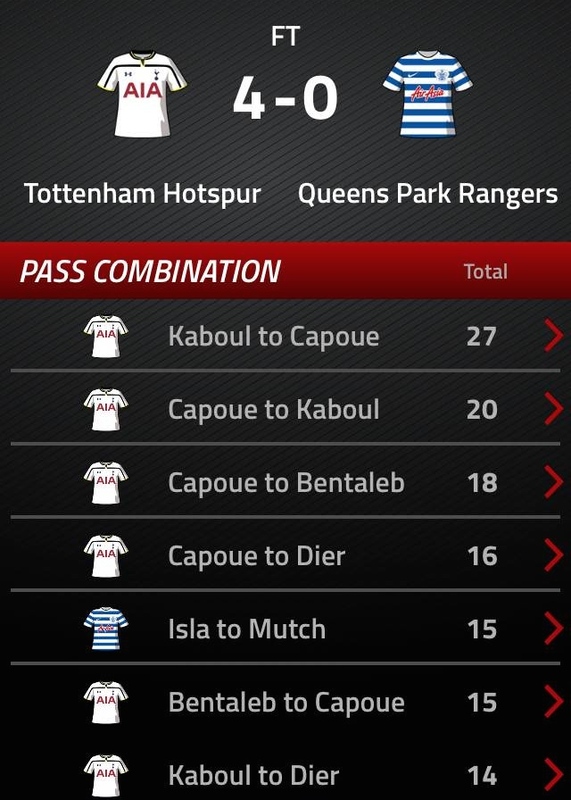 It's also worth briefly nothing Emmanuel Adebayor's superb contribution against QPR. It's been suggested that Adebayor doesn't suit the new system, but this is subjective to both those casting opinions and the player himself. 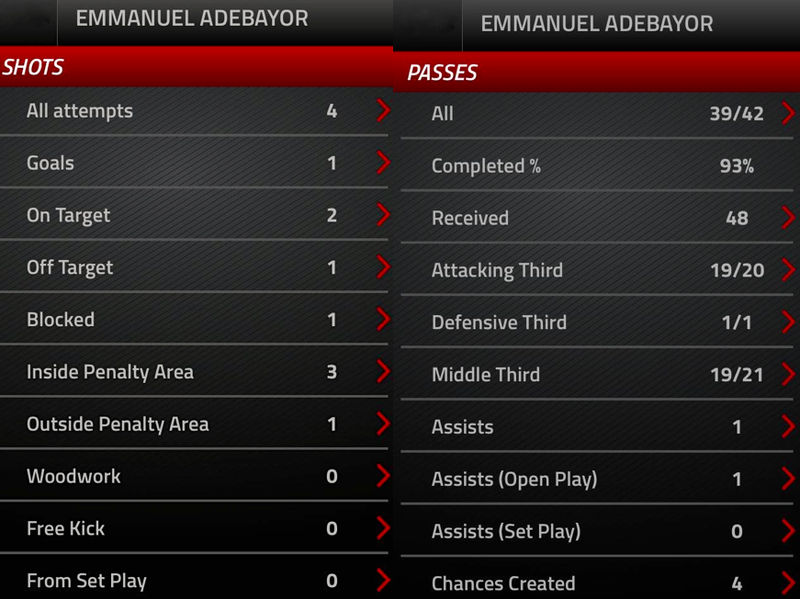 Adebayor suits any system when he can bothered. The striker's mindset ostensibly changes game to game, which is hugely unfortunate. After offering little or nothing at Upton Park, Adebayor brought White Hart Lane to life on Sunday with the effort and charisma he oozes on his day. Dropping deep to aid the retention of possession, providing a goal plus an assist and generally looking up for the challenge, this is the Adebayor that must be tempered and mitigated so that there is some kind of consistency. That's if they hadn't already. Kaboul looked very unsure throughout the West Ham game, particularly in the first half-hour. He also very nearly gave a goal away in the second half, bringing the ball out from defence before losing it to Kevin Nolan. Kaboul couldn't catch the Hammers midfielder, who forced Hugo Lloris into a low save. Tottenham's skipper simply didn't have the pace to track back. His speed was a key attribute during the 2011/2012 campaign in which he was Spurs' best defender by a country mile. Injuries have taken their toll on a fine defender, who would still be at the top of his game if it wasn't for losing his sharpness. The same thing happened a couple of times against QPR. 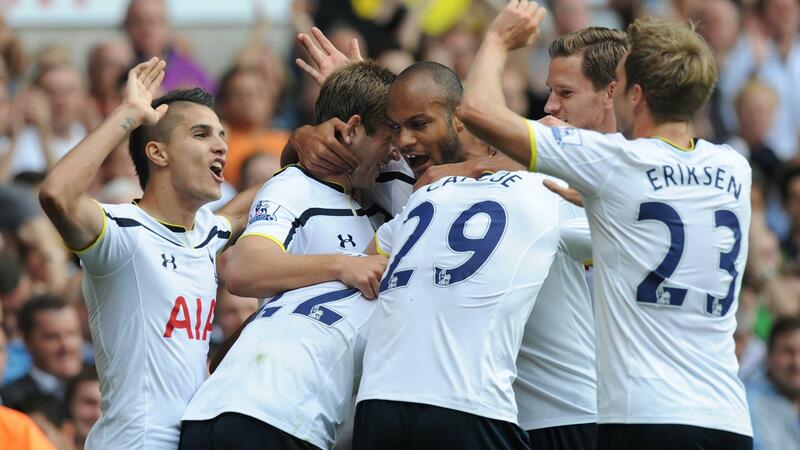 Kaboul was shown up by defensive partner Jan Vertonghen's brilliance on the ball. The former's defensive skills weren't exposed as blatantly as they were at Upton Park due to the QPR's ineffectiveness going forward, but the signs were already there towards the end of last season. Rumours of a possible transfer to Lazio surfaced earlier this month. Perhaps Kaboul would be more comfortable in Serie A, a notably slower league. Replacing either him or Michael Dawson with a versatile central defender, presumably Sevilla's Federico Fazio, would immeasurably benefit the squad defensively. Some may have known this prior to Tim Sherwood's endorsement of youth during his short tenure, but it is now clear to all there is a promising group of young players breaking into the first team. Nabil Bentaleb and Harry Kane have performed admirably since emerging into the senior fold. Ryan Mason is also expected to play a part this season after impressing the coaching staff during pre-season. The arrivals of Eric Dier and Ben Davies have only added to Tottenham's wealth of young talent. Dier had a dream debut, scoring the winning goal and playing very well at both centre-back and right-back, before bagging his second goal in as many games against QPR. West Ham's tactics made if difficult to properly analyse Dier's performance - he dealt with constant aerial bombardment well, but didn't have much to do with his feet other than his well-taken winner. Starting at right-back on Sunday, Dier look confident and competent; a snip at £4million. Ben Davies should gradually emerge as Tottenham's first choice left-back this season. Pochettino is clearly a fan of Danny Rose, who was brilliant against QPR, but the 24-year old will be truly tested against Liverpool and Arsenal in coming weeks.While the new man in charge may aid Rose's development, Davies is arguably a ready-made, consistent Premier League left-back and that can't be ignored. Rose should stay in the team as long as he keeps up his current standards, but in the meantime it is extremely promising to see young, competent cover at both left-back and right-back in Davies and Dier.